While developing her exhibit, Ashley Althoff explored organic forms with common materials humans come in contact with on a daily basis. The 2017-18 Bing-Davis Memorial Gallery artists’ schedule continues with a senior thesis exhibit featuring the works of Upper Iowa University students Ashley Althoff and Katie Brooks. The Althoff and Brooks exhibits will be open to the public during regular gallery hours Monday, February 12 – Friday, February 23. A reception for the two UIU art majors is scheduled from 4:30 – 7 p.m. at Bing-Davis Gallery on Thursday, February 15. While developing her exhibit, Althoff explored organic forms with common materials humans come in contact with on a daily basis (e.g., newspaper, water, concrete, ceramic, metal) to create an environment representing where these materials derive. Growing up in rural northeast Iowa between the Guttenberg and Luxemburg communities, Althoff is a graduate of Western Dubuque High School. 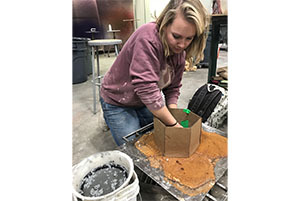 She obtained an associate degree from Northeast Iowa Community College, before transferring to UIU, where she developed what has become her main artistic passions – printmaking, oil painting, and working with sculptural materials, such as metal, paper pulp, wood and clay. The senior’s Upper Iowa experience also provided a number of opportunities to interject her artistic skills into various community and business projects. Althoff worked closely with UIU business professors in creating a website for a nonprofit Nicaraguan organization and taking a study abroad art and architecture trip to Italy. In addition, she interned with Elkader’s Art in the Park, Clayton County Development Group, and as a gallery curator at UIU’s Fayette Campus. Along with these art and administration opportunities, Althoff worked as a community assistant with Full Circle Services, Inc.
Now living in Strawberry Point, Althoff plans to continue sharing her art knowledge and assisting with marketing and cultural programs in local communities and committees. Her main goal is to set strong examples of what a community can achieve and be, so other communities are inspired to do the same. Brooks explains that “Embrace” encompasses the idea of welcoming fears, beauty and the “other.” The figures she created developed from a childhood fascination with what it would feel like to be an animal, other than human. They are projections of her thoughts, ideas and feelings. A Manchester, Iowa, native, Brooks attended Kirkwood Community College, where she developed a passion for working with ceramics and glass. She continues to primarily use these two mediums, but while attending Upper Iowa has expanded her artistic talents into fabric, metal and natural dyes. Brooks also enjoys screen printing, experimenting with drawing and dancing. 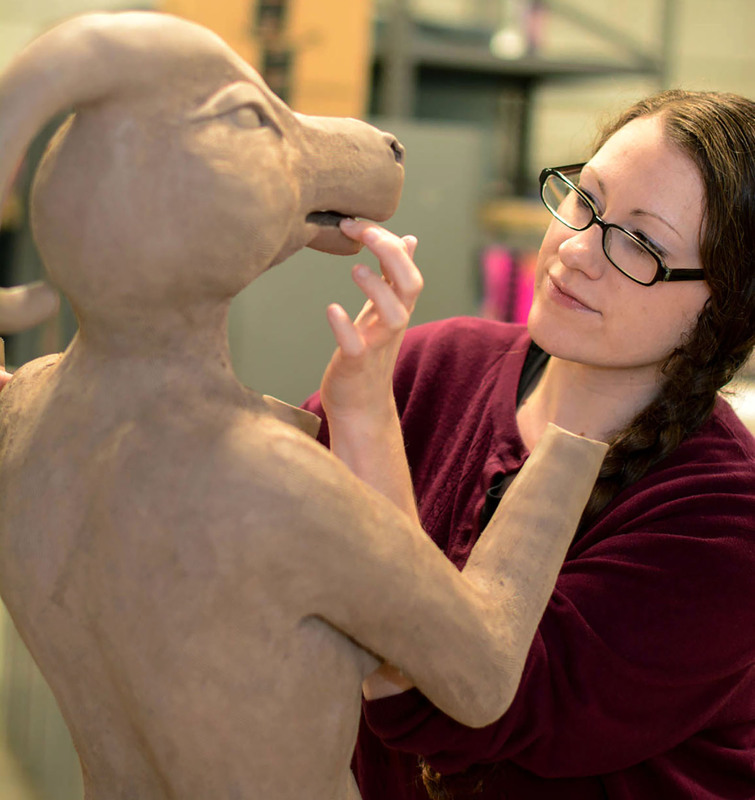 Brooks has participated in group exhibitions, including Iowa Crafts exhibitions at the MacNider Art Museum in Mason City, Iowa, where she was awarded Best in Other Craft Media for a glass sculpture and Jurors Special Mention in clay for a ceramic sculpture. She also won Best in Show at UIU’s Community College exhibition for a wood-fired pitcher.